MADRIX PLEXUS features a 15-pin, serial connector with individually addressable ports. The extension port makes it possible to connect external analog or digital devices for remote control. In MADRIX, please open the menu 'Tools' > 'PLEXUS Configuration…' > 'Extension Ports' to configure each port individually for the corresponding PLEXUSConfiguration. Select a PLEXUS Configuration first. For more information, see Stand-Alone Mode. Note: A maximum of 100 mA can be shared across pins. 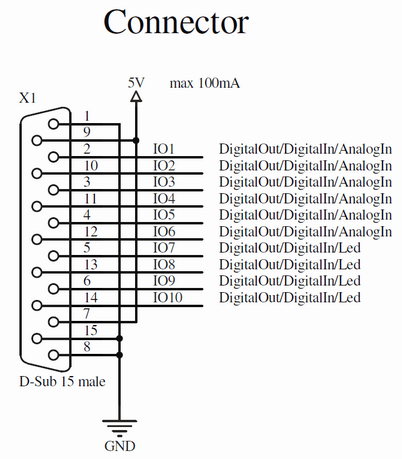 The combined power of Pin 7 and Pin 9 can be a maximum of 100 mA. You can connect different equipment to these Ports. In general, the Port can work as an input to receive a signal from external equipment. According to your PLEXUS Configuration, it can then trigger a certain action/behavior. Or it can function as output to send a signal to the external equipment, which then can process this signal. You may attached external analog or digital devices to the extension port. Examples include for example external buttons, light barriers, small light diodes. The following drawings provide further, technical details on how to use the extension port.